A still from a dashboard camera before Terence Crutcher was shot to death. The Tulsa, Oklahoma, police department released new video footage yesterday of the shooting death of Terence Crutcher, a 40-year-old black man, on Friday. The footage from a cruiser’s dashboard camera and a helicopter overhead appears to contradict the police officers’ version of the incident and has sparked outrage nationwide. Crutcher was on his way home from a music-appreciation class at a local community college in Tulsa, Oklahoma, when his SUV stalled around 7:40 p.m. 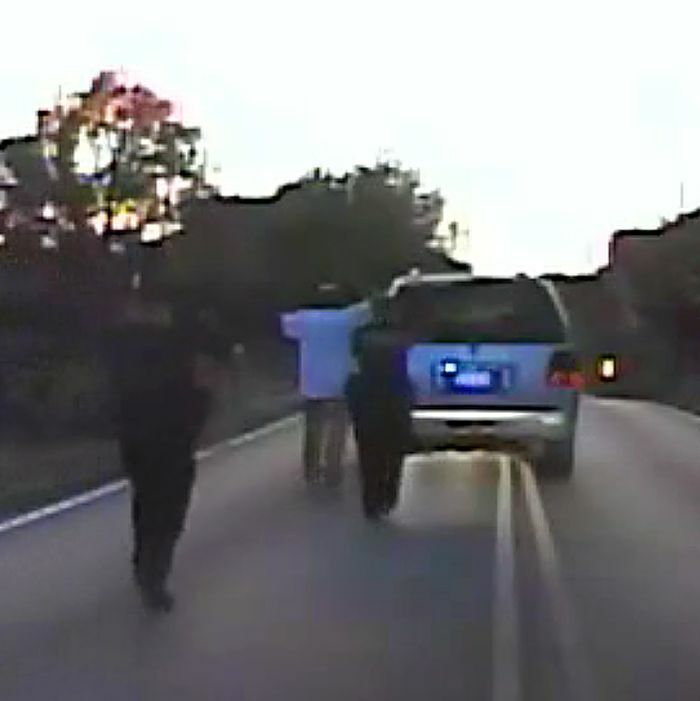 The footage shows Crutcher standing in the middle of the road with his hands in the air, then slowly walking toward the car and leaning against it at the direction of police. What happens next is obscured by the officers and the vehicle, but a shot is fired and Crutcher falls to the ground. Police say he was Tasered by Officer Tyler Turnbough, then shot once by Officer Betty Shelby. Officers then waited nearly two minutes before offering him any kind of assistance. Crutcher died later at the hospital. Police say he was unarmed and had no weapons in the car. Officer Shelby came upon Crutcher while heading to another call. Police said she requested backup, saying she was “not having cooperation from the person there.” Officer Turnbough and his partner responded to her call, and the dashboard camera is from their vehicle. According to the New York Times, Shelby’s lawyer said she believed Crutcher was armed, and he was acting erratically, failed to comply with several orders, tried to put his hand in his pocket, and reached in the car window before he was shot. Officers Shelby and Turnbough have been put on administrative leave with pay. The Justice Department has launched a civil-rights investigation into the shooting. According to the watchdog site killedbypolice.net, Crutcher was the 825th person killed by police since the beginning of 2016. Nearly 400 black men alone have been killed by police since the beginning of 2015. In April 2015, a reserve sheriff’s deputy fatally shot a black man in the same county where Crutcher was killed. That deputy was convicted of manslaughter and sentenced to four years in prison. All over the country, people reacted to the videos with grief and rage. During a press conference on Monday, Crutcher’s family called on protestors to be peaceful and asked that criminal charges be brought against the police who were involved. At a press conference on Monday, Terence Crutcher’s twin sister, Tiffany Crutcher, said that “negligence, and the incompetency, and insensitivity” led to her brother’s death.